Linda Christensen is a sculptor and has been carving butter busts of Princess Kay of the Milky Way at the Minnesota State Fair for over 30 years. A graduate of the Minneapolis College of Art and Design, she has had her own line of gift cards, and has even created a bust of Conan O'Brien from bacon and white chocolate. Linda Christensen is a sculptor and has been carving butter busts of Princess Kay of the Milky Way at the Minnesota State Fair for over 30 years. A graduate of the Minneapolis College of Art and Design, she has had her own line of gift cards, and has even created a bust of Conan O'Brien from bacon and white chocolate. Unlike other sculptors who use wire or wooden frames to form busts, she strips away material from a solid block, and for this reason Christensen likens her process to carving instead of sculpture. 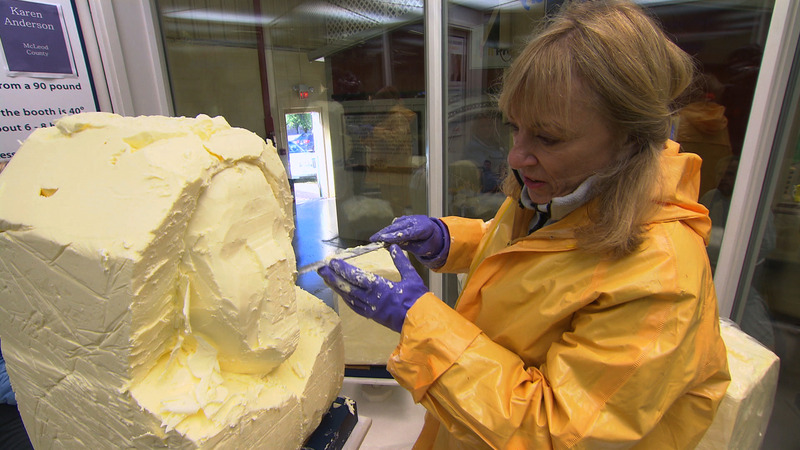 She is also the only butter carver in the nation to work with live models. Christensen takes pleasure in helping showcase the glamour of girls who normally do not get the opportunity to be glamorous doing so much hard labor on their farms. She is proud to be part of such iconic Minnesota tradition, and says that she will continue carving here each year as long as she's physically able. Sculptor Linda Christensen has carved butter busts at the MN State Fair for over 30 years.